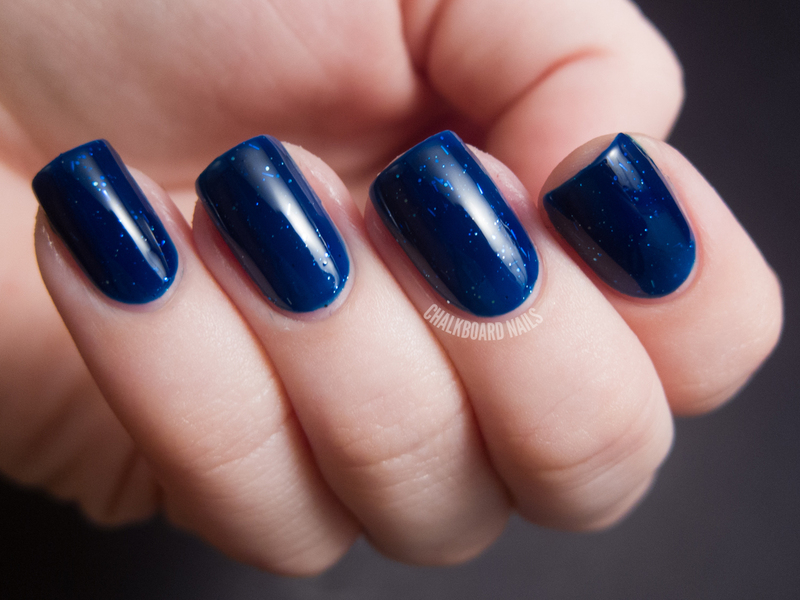 Cirque Colors Tibetan Nights is a rich, dark blue jelly with micro silver glitter and tiny silver bar glitters. I have used three coats in this swatch. This polish is super duper beautiful. The delicacy of the silver glitters in combination with the rich royal blue jelly is quite lovely. The blue is one of the prettiest shades of blue that I have ever seen, and the polish itself is very glossy. The glitters in this don't affect the finish... it's smooth as glass. The formula on Tibetan Nights is pretty thin. It can be a little runny so take your time applying and do thinner coats instead of trying to pile on the polish. Another thing to note about this polish is that I had some problems with glitter sinking. Some of it remained suspended, but a lot of it collected at the bottom of the bottle. This could be due to the thinness of the formula. Even with vigorous shaking, most of it remained out of reach. All Cirque polishes are .45oz and 3-free. They are lightly scented with lavender and clary sage oils, but I didn't notice the scent lingering past topcoat application. Tibetan Nights retails for $12. The other polishes in the Dark Horse Collection range from $12-$16. You can check out my previous reviews of Cirque polishes here. The product in this post was sent to me by the manufacturer or their PR. Also, I have to say - they should hire you to do their swatch photos. It looks so much more amazing and has a great deal more depth in these photos than the swatch on their site. That is a stunning shade of blue, I love it! Wow this is really pretty! OH my gorgeous! I have this and haven't tried it yet! also i was on OPI's site and i saw you were this months featured blogger!! I love this one! It's so pretty with the glitter trapped in the base. His creations are perfect and beautiful nails. So gorgeous! I just got my first Cirque (Epoch) and I'm loving this brand! Just saw this on Gotham Polish....gads is this a beauty! I have nothing even close to this. Wow! This deserves a GIANT WOW!! Simply gorgeous. this blue is amazeballs!!! simply gorgeous! I love this! It really does look like a beautiful night sky. I guess I am the only one who was not feeling this. I really wanted to love it becuase I am a fan of starry night polishes and love different varieties but the the lack of glitter and then some of it being bar glitter just did not do it. If it had more glitter and the right type, it would stand up to it's name but for me it was disappointing.